The East Texas Men in Harmony chorus earns most of its income through live performances and recording sales. We rely on our friends and patrons for donations that bring financial balance to our operating budget. 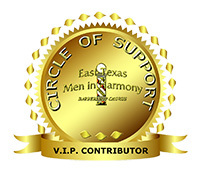 Your tax-deductible contribution to the East Texas Men In Harmony Circle of Support would mean so much to the Chorus. If you enjoy high quality live a capella musical performances, become a supporting member of our chorus by joining our Circle of Support. The Circle of Support Fund will help ensure that we can continue our mission of bringing beautiful music and our positive message to our audiences for decades to come. The Circle of Support directly supports our yearly operating budget. Your donation to the Circle of Support directly empowers one of the important missions of the chorus, to provide donations to the Harmony Foundation and many more musical enrichment activities. Because The East Texas Men In Harmony Chorus is a 501(c)(3), not-for-profit organization, your gifts are tax deductible in the year of the gift. Please consider becoming a part of the Circle of Support by making a monetary contribution to our work. You may donate any month of the year and your donation will remain active for one year to that month. To maintain active membership status, members must contribute on an annual basis. You can join us by making an annual tax-deductible gift at one of the following three levels. Two reserved seat tickets to our Annual Spring Show (matinee or evening), two afterglow tickets, a CD recording and listing as a Circle of Support patron in our show program. Four reserved seat tickets to our Annual Spring Show (matinee or evening), four afterglow tickets, two CD recordings and listing as a Circle of Support patron in our show program. Six reserved seat tickets to our Annual Spring Show(Matinee or evening), six afterglow tickets, three CD recordings and listing as a Circle of Support patron in our show program. To underwrite and/or contribute support to the Harmony Foundation whose mission is to provide financial support to Youth Camps and Choruses, and provide assistance to all facets of the Barbershop Harmony Society. We would love to visit with you to open a dialogue of partnership between your company and The East Texas Men In Harmony Chorus! Please contact us via email through etmeninharmony.com or you may speak directly with our Chorus President, Brad Gadt at ‭972-824-6929.